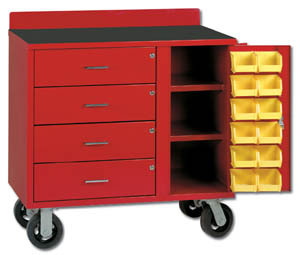 Heavy-duty, all-welded portable bin cabinet adds mobility and versatilly to your workplace. Easily store and transport parts and supplies wherever they're needed. Product No. Size H x W x D No. Bins Includes Cap. (lbs.) Wt. (lbs.) Price Ea.